LIEUTENANT GENERAL TROUP MILLER JR. Retired December 31, 1963. Died May 14, 1988. Lieutenant General Troup Miller Jr., commander, Air University, called Atlanta, Georgia, his hometown. After graduating from St. Lukes School, now Valley Forge Military Academy, Wayne, Pennsylvania, he entered the U.S. Military Academy and graduated as a Second Lieutenant of Cavalry in June 1930. He began flying training in the fall of 1930, and after graduating from flying schools at March Field, California, and Kelly Field, Texas, was rated a pilot and transferred to the Air Corps in December 1931. General Miller's first assignment as a flying officer was with the Second Bomb Group, Langley Field, Virginia, where he served as squadron engineering officer and assistant group operations officer. He became a flying instructor at Kelly Field in July 1936. In November 1940 he assumed command of a training group at the Air Corps Advanced Flying School, Maxwell Field, Alabama. He was project officer at the Air Corps Replacement Training Center, Maxwell Field, from March to May 1941, and then became project officer at the Air Corps Advanced Flying School, Valdosta, Georgia. In October 1941 he assumed command of the Air Corps Replacement Training Center at Maxwell Field, Alabama. In March 1942 General Miller became assistant project officer at the Army Air Force Combat Crew School, Smyrna, Tennessee, and the following June, was appointed director of training there. His next assignment took him back to Maxwell Field as assistant commandant of the Army Air Force Pilot School (Four-Engine). He entered the Army-Navy Staff College in October 1943 and graduated in February 1944. His next World War II assignment was in the Southwest Pacific theater of operations as deputy chief of staff of the Fifth Air Force, and in June 1944 was named deputy chief of staff of the Far East Air Forces there. He assumed command of the 59th Air Service Group in January 1945 and was appointed chief of staff of the 13th Bomber Command in May 1945 also in that theater. From July to September 1945 General Miller commanded the 13th Bomber Command, and then resumed his former position as chief of staff. Following World War II, General Miller was assigned to the Army Air Force School at Maxwell Field, Alabama, as assistant to the assistant chief of staff for operations. In March of 1946 he was appointed chief of the plans division of the academic staff of Air University. General Miller entered the Air War College at Maxwell Air Force Base, Alabama, in August 1948 and graduated in June 1949. Then he became executive officer in the office of the deputy chief of staff for materiel, Air Force headquarters. He was named director of industrial resources of that office in February 1951. In July 1953 General Miller assumed command of the Northern Air Materiel Area (Europe) with headquarters in Burtonwood, England. During his service there he was responsible for the operation and development of NAMAE, consisting of two major overseas air depots with over 14 widely scattered separate organizations. General Miller commanded the Arnold Engineering Development Center at Tullahoma, Tennessee, from August 1956 util June 1960 when he became vice commander of Air University. On Aug. 1, 1961, he assumed command of Air University. Decorations awarded to General Miller for outstanding service include the Legion of Merit and the Air Medal. He is rated a command pilot. 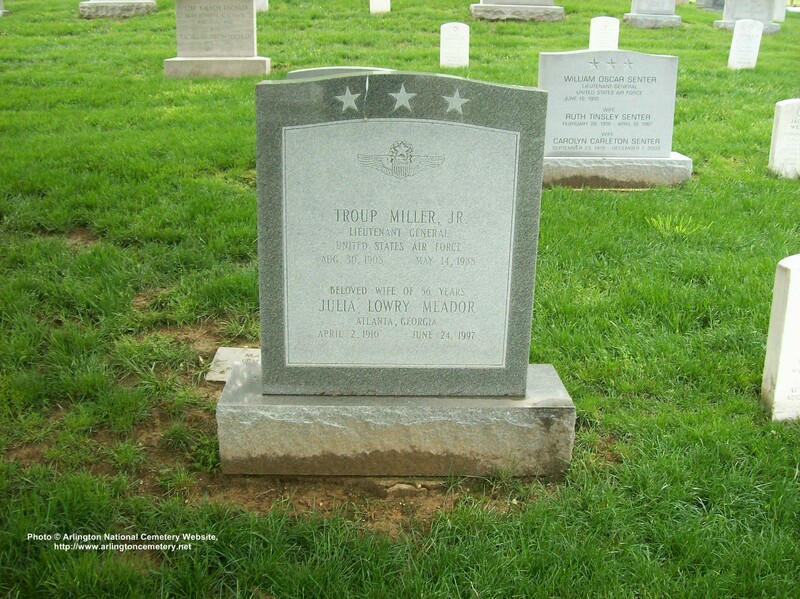 Also buried in Arlington National Cemetery is his father, Troup Miller, Brigadier General, United States Army.